These days, it sometimes feels like businesses keep somebody on their payroll just to constantly crunch numbers and deduce the bare minimum that can be offered at the highest price. In that kind of atmosphere, what it takes to stand out in the crowd is easily, yet rarely done: offering customers more for their money. But with The Foam Factory’s decision to transition many of their comfort and support products to higher-grade Medical Foam, giving customers more for their money is just what they plan to do. Among The Foam Factory’s comfort products, like sleeping pillows and body bolsters, many are offered in two styles: 5LB memory foam, and standard Poly open-cell foam. Some prefer the more traditional feel of conventional foam over the unique feel of memory foam, while others who don’t have lofty demands for pillows simply like the comfort they get from the Poly Foam while saving money over the memory foam variety. As such, the Poly Foam option offered for many of their pillows and bolsters has served The Foam Factory’s customers well for years. However, as their business grows, and with their recently expanded warehousing capability, The Foam Factory realized they would be able to upgrade some of their Poly Foam products to a higher-quality material. While there’s nothing strange about a company making material changes to their product lineup, there certainly is something different regarding the way The Foam Factory plans to do it. Despite their plans to replace many Poly Foam products with higher-grade Medical Foam, those new Medical Foam products will stay at the same affordable price points as the Poly Foam versions before them! It would be easy to view this skeptically, wondering if the Medical Foam is even an upgrade, as it is rare for a company to offer an improved experience without ratcheting up the price. But in the case of this Medical Foam transition, there are a handful of cold hard facts that show the quality and areas of improvement Medical Foam provides. The one that clearly illustrates Medical Foam as a higher-quality product is its density rating. Medical foam carries a 1.5LB density rating, compared to Poly Foam’s 1.3LB density. While 0.2LB may not seem like much, when the difference between a very high-quality product and one that is only suggested for occasional use is less than 2LB of total density, 0.2LB is a meaningful jump. More density means increased durability and a longer functional life, as it directly reflects more performance material versus air in a product. Medical Foam also touts a 35LB ILD, keeping pace with Poly Foam at a 36LB ILD. For additional information on interpreting density and ILD, take a look at Examining Foam’s Density, Weight, and Firmness Characteristics. In addition to test data figures, are two other less-technical, but equally important factors that separate Medical Foam and make it a worthy upgrade. With anti-microbial additives included during the material’s formulation, Medical Foam is a good choice for applications where people are in direct contact with a cushion or pillow, especially for extended periods of time, like while sleeping. To make a long story short, those additives make for a more hygienic product that is less prone to causing irritation. 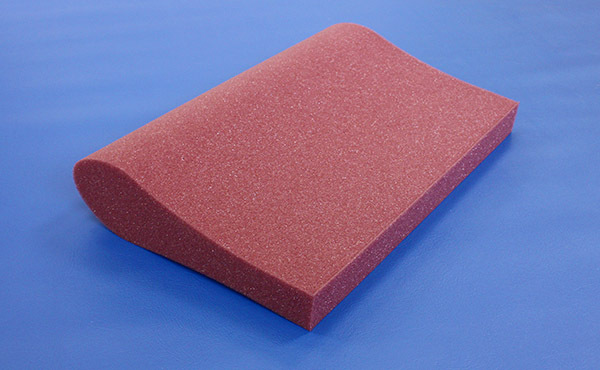 The other factor leading to The Foam Factory’s switch is Medical Foam’s burgundy color. White and lighter-colored foam has a tendency to yellow over time, and while that has no bearing on its functionality or performance, it can be unsightly to some people. This yellowing is hastened by contact with body oils, lotions, and creams, which pillows often deal with. 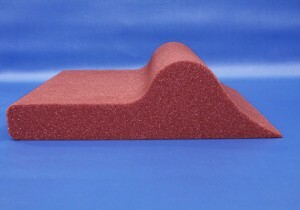 With its darker, burgundy color, Medical Foam is more resistant to discoloration over time. While that has no affect on the performance of the pillows, it would be foolish to think aesthetics play no role in purchase decisions. In burgundy, years down the road Medical Foam pillows will look the way they did when you bought them. As for customers who still have a preference for Poly Foam pillows, The Foam Factory will continue to sell them as long as the current stock lasts. At that point, the products will fully transition to Medical Foam! If you have any questions regarding the availability of remaining Poly Foam pillows or bolsters, don’t hesitate to contact us!